What do The Voice, NCIS, Wheel of Fortune, and The Big Bang Theory all have in common? All of them can be watched for free using a simple HDTV antenna. Sometimes we forget that many of the shows we like are on CBS, NBC, ABC and FOX, which don’t require a cable or satellite subscription at all. Now you’re probably saying, “Yeah, but I DVR all that stuff”. Well, we have a solution for that in a few paragraphs below. While it could seem like a step backwards, over-the-air television plays a huge role in the cord-cutting lifestyle. For nearly a decade now, the old rabbit-ears that used to allow viewers access to local channels have been almost rendered obsolete. The analog signals these antennas used to receive have been replaced with a digital. 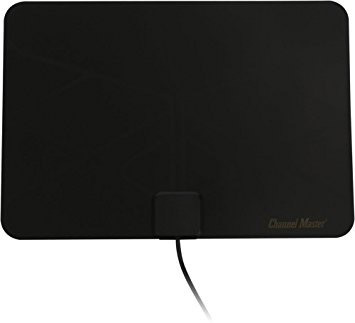 You can watch your local broadcast channels in stunning 1080p quality with a cheap HD antenna. If you’re a cable or satellite TV subscriber, it’s probably been a while since you hooked up an antenna and scanned for local TV signals. If you don’t have an antenna laying around, you can use this handy TV signal locator tool. It not only gives you a list of channels that can be received at your address but strength of signal measurements and which direction you should aim your antenna for optimal reception. Many of these signals are duplicate channels because networks broadcast from all sorts of different areas. Today’s antennas are powerful to pick them up. I’m getting all of the major broadcast networks (CBS, NBC, ABC, FOX, PBS, CW) in green, so I can disregard the yellow and gray. When you generate your signal report using a site like TV Fool, see which color category your local networks fall within. This color code corresponds to the type of antenna you would likely need to receive the channel. Keep in mind, where the antenna is positioned and how many obstructions lie between the antenna and the open air will impact the antenna’s effectiveness. As a rule of thumb, the higher the antenna and the fewer obstructions, the better the signals you will receive. After getting some signal locator data, the next question you need to answer is how strong of an antenna do you need. For the channels broadcasting closest to your address, a simple passive antenna should suffice. In operation, these antennas are the closest relatives to the old “rabbit-ears” from the analog signal days. In appearance, however, most of these antennas look like flat, plastic office folders. This flat design has proven to be quite effective in grabbing digital channels out of the air; but it also means you need to be purposeful in how you aim them. Operation is simple. You plug the antenna into the coaxial port in the back of your TV (or analog-to-digital converter if your TV was made before 2007), mount the antenna to a wall or window, scan for channels, and you’re good to go. If the broadcast signals you are trying to pick up are a bit farther away or your antenna has a handful of walls or other obstructions between its position and the open air, the next step up from the passive antennas is an amplified antenna. Many of these antennas are similar in design to their passive counterparts, but they require electrical power (either through USB or an AC adapter). This added power can often be the boost needed to turn an in-and-out signal on a passive antenna into a clear and crisp one. It is worth noting that in some cases, passive antennas can actually outperform their powered counterparts if there is excessive noise interfering with a signal. This tends to be the exception rather than the rule though. Not surprisingly, the addition of power comes at an additional price; however, it won’t break the bank (especially when compared to the cost of the cable-box rental you’ve been paying for!). Some of the best models like the Mohu Curve 50 and the Clearstream Eclipse are quite affordable at under $75. Ultimately, antenna height and position are still the most important factors in getting the best signal quality, even with the extra electrical boost of an amplified antenna. If you live far away from the nearest broadcast towers, outdoor antennas are the best option. These antennas are designed to withstand the elements and deliver the strongest reception possible, free from the structural and electrical obstructions that can hamper the performance of their indoor cousins. For outdoor antennas, the same rules apply: higher is better, and active is typically stronger than passive. Prices for outdoor antennas vary widely based upon size and strength. You can buy serviceable models like this one by 1byone for as little at $29.99, or larger, stronger models like this one from Channel Master for just under $150. Both of these outdoor, roof-mounted options will get better reception than indoor antennas. However, if you’re less than 30-35 miles away from the broadcast towers, you’re probably fine with the ease and low cost of an indoor model.